Bindi Sue Irwin is a passionate wildlife conservationist, who has inherited her parents' love for wildlife and wild places. Born to Wildlife Warriors Steve and Terri Irwin, Bindi is a determined soul, destined to make a positive difference on the planet. Australia Zoo has always been her home. Every animal is part of her family. She could not get through her day without connecting with the animals around her, particularly the echidnas which are her favourites. 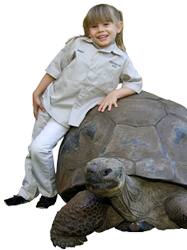 Bindi made her television debut through The Crocodile Hunter and has a naturally kind and engaging personality. As Bindi: The Jungle Girl, she used her enthusiasm for wildlife to help educate others, both young and old, about the importance of caring for wildlife. As Bindi has grown, so has her passion for conservation. She has travelled the world, visiting wild places, to learn more about the planet she wants to protect into the future. Through Wildlife Warriors, Bindi continues to work with her family to share her message of conservation. Logie Award winner for "Most Popular New Female Talent"
2009 Nickelodeon Kids Choice Awards winner "Biggest Greenie"
TV Week Logie Award nomination for "Most Popular Female Television Presenter"